A very efficient, compact, sharpening stone. The DC3 is made by Fallkniven, who produce a serious range of knives and sharpening kit. 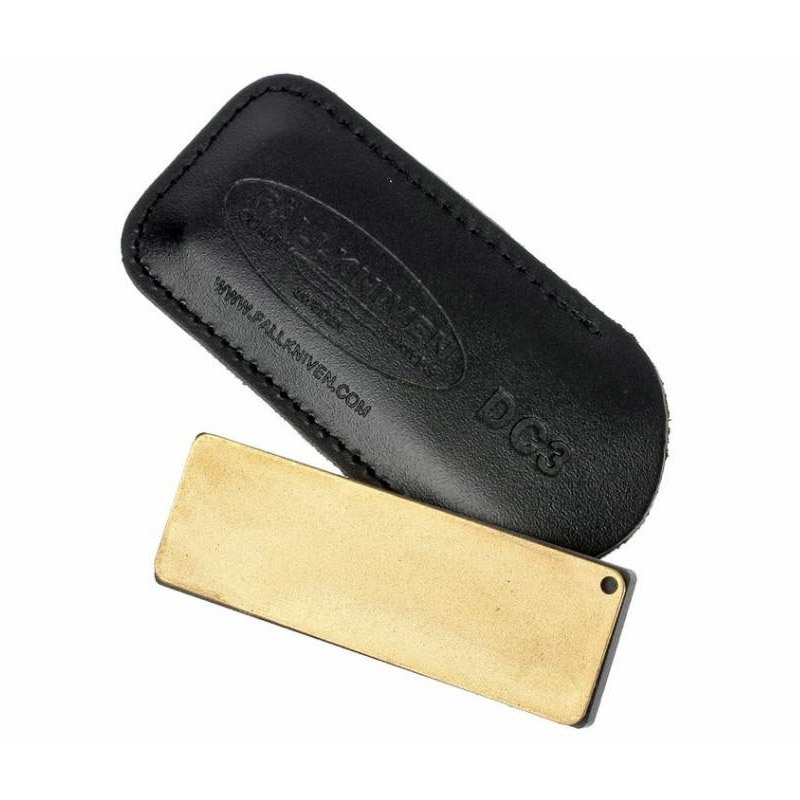 The DC3 stone is a diamond/ceramic sharpening stone designed to be carried with you in the field within its leather carrying pouch. The diamond side comes in at 25 micron and the specially designed ceramic is made from synthetic sapphire, enabling you to get a "shave sharp" edge on your knife. These materials performance actually improves with use and the stone will hold its shape which is vital for sharpening well. We also like these stones as they can be used dry with no other form of lubrication, which makes them an efficient field stone. To sharpen your knife you can use a circular motion or a straight forward slicing motion, they come with full instructions. "I have worked with sharp tools all of my professional career and one of the biggest issues you can face when working with tools is how to create, and then maintain, a sharp edge to work with. We use shave sharp knives and axes on our courses as this decreases the chance of injury. If your knife is shave sharp it will work better with the material you are working on, and if you are unfortunate enough to suffer a puncture wound, ok it will go straight down to the bone, but it will be a nice clean wound and so easier to treat and therefore heal. Therefore having a non lubricated field stone that is capable of putting a shave sharp edge on to your tools available to us is perfect... well done fallkniven for once again proving you are a leader in the field"
Advantages: No lubrication is required, they are cheap, they can put a shave sharp edge on your knife, they are pocket sized, light, and we like the pouch it comes with to protect it. Slightly smaller than the DC4 version making it ideal to carry around in your pocket all the time. Disadvantages: They are smaller than say a workshop stone which can be a little tricky to get used to but you wouldn't want to carry a workshop stone out into the woods!